It was quite a year. 1964. Ali beat Sonny Liston. UCLA’s men’s basketball team went 30-0. The Celtics won their 6th straight NBA title. The Yankees lost to the St. Louis Cardinals in the World Series. And, an automobile that took an amazingly short 18 months to go from concept to public introduction created a frenzy at the New York World’s Fair and sold over 22,000 units in one day. 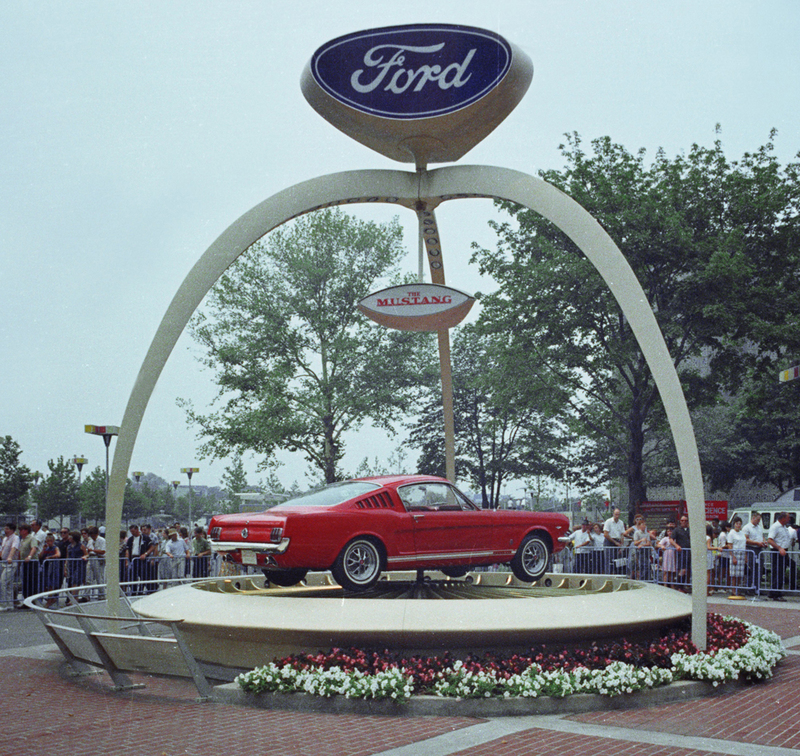 It was April 17th, and with a major publicity build up, Ford unveiled its new “pony car” to an army of reporters who gathered at the World’s Fair in Flushing Meadows, NY who quickly filed over 2,600 stories that appeared the next morning across the United States and fed a buying frenzy. There were lines around the block in major cities and small towns. Police had to be called to manage the crowds. There had been a “tease” of the new car concept in 1962 when Dan Gurney unveiled the “Mustang 1” at the U.S. Grand Prix at Watkins Glen and turned demonstration lap times only slightly slower than the competing Formula 1 field. The crowds cheered. The engineers took notice. The marketers, led by Lee Iacocca as head of the Ford Division, put the project in high gear and turned it over to the designers. Ford had great hopes for the Mustang, and planned on selling 100,000 of the new cars during the first model year, which was dubbed “1964 1/2.” The base price was $2,368, but consumers quickly found out that they could add improvements and serious engine upgrades that made the Mustang drive as good as it looked. It took only 3 months for Ford to sell out it’s first allotment of 100,000 vehicles. By the time the dust settled at the end of the full 1965 model year, another 560,000 ponies rolled off the assembly lines (Ford originally had only one plant making the cars, but quickly brought two more on line to meet demand). As the Ford Mustang turns 55 on April 17th, 2019, the marque continues to be a driver favorite, having brought over 10,000,000 vehicles to the public. And, what of the competition FR500 Mustangs that sports the Skip Barber Racing School distinctive red, white and black paint scheme? They were designed by Ford strictly for the race track and given Ford Racing numbers, not VIN’s. Every cubic centimeter a racing machine, the SBRS Mustangs are kept in racing tune by school engineers who love the car, respect the marque and ensure that our drivers get peak performance from these fiery machines.